Migrant Deaths in the Arizona Desert, published by the University of Arizona Press, addresses the tragic results of government policies on immigration. The contributors consist of a multidisciplinary group dedicated to the thousands of men, women, and children who have lost their lives while crossing the desert in search of a better life. Each chapter seeks answers to migrant deaths, speaking to the complexity of this tragedy via a range of community and scholarly approaches. The activists, artists, and scholars included in this volume confront migrant deaths and disappearances in the U.S.-Mexico borderlands as they reflect on the startling realities of death, migration, and public policy. The book was edited by Raquel Rubio-Goldsmith, Celestino Fernandez, Jessie K. Finch and Araceli Masterson-Algar. Although I was born and raIsed in the desert regions of the U.S. Southwest, specifically in Tucson, Arizona, it was not until I lived else where, especially in Chicago and Seattle for several years, that I began to notice the desert with new, more alert and fresh eyes. I left Arizona to study religion at the University of Chicago and was immediately cognizant of the distinctiveness of my new surroundings. If it is the unique and incomparable saguaro cacti that command one's attention in the deserts of Arizona, in Chi cago it is the buildings and skyscrapers downtown and the skyline along the lake that evoke a feeling of awe. If the immensity of Lake Michigan reminds Chicagoans of their belonging and dependence on nature, the vastness of the desert terrain does the same for Arizonans. As I look back at my time in Chi cago, I am convinced that besides preparing me for a life of study and teach ing, the contrast of this great urban city with my desert experience in Arizona led me to reassess the desert and U.S.Mexico border regions of my upbring ing. Perhaps, in addition to the substance of my theological learning, the dis tance from the Southwest gave me the perspective that I needed to understand and interpret the desert and border regions in a new light. After graduation and a couple of years in Seattle, I returned to Tucson to teach at the University of Arizona. A passage from T. S. Eliot's Four Quartets kept returning to my mind: "We shall not cease from exploration and the end of all our exploring will be to arrive where we started and know that place for the first time." Everything was indeed new to me. The distinct, fragrant scent of the sum mer rains falling on the parched desert ground was more poignant than ever. Ah, the wonderful smell of wet creosote bushes. The beauty and rarity of some of the cacti here—the saguaros, the organ pipe, the ocotillo—greeted me as if I were an explorer first entering this territory, a Cabeza de Vaca or Fr. Eusebio Kino. Indeed, I could see how surprising and unexpected some of this terrain might appear to someone who associates the idea of "desert" with Saharalike desolation. The Southern Arizona desert is amazingly verdant and mountain ous. Here the deserts are pregnant with life, home to a great diversity of animal and bird species. If some of the ancient Egyptian monks described the desert as a wasteland, they also saw in it the seeds of a potential paradise, a "desert blooming with the flowers of Christ. "2 This vision of a desert in full bloom is easily understood by anyone who has visited the Sonoran Desert regions of the U.S.Mexico borderlands. But there was something else happening in the desert that interrupted my contemplation of its surprising beauty: a growing number of migrant deaths. In the summer months the reports of women and men, children and infants dying in the desert is as endless and unforgiving as the heat of the sun. Almost inex plicably, every summer for the past several years seems to register a new record of deaths in the borderlands. In my work with a couple of human rights groups, particularly Humane Bor ders and Borderlinks, I have come face to face with many immigrants begin ning or in the midst of their journey to the north. Over 1,000 immigrants per day pass the doorstep of the small town of El Sasabe, Sonora, Mexico, with dreams that the ancient Israelites must have shared in their exodus from a land devoid of milk and honey. The first time I encountered a group of these pil grims, besides being struck by the number of women and children, I could not help but recognize myself in their sunburned faces, as every American with an immigrant past might understand. If the Statue of Liberty was the welcoming symbol of past generations of European immigrants, the desert of our south ern border is now the symbol of new generations of the tired and poor, of the huddled masses. However, it is easy for many Americans to repress memories of their immi grant past. Perhaps such memories conjure feelings of insecurity and anxiety that prove too frightening to summon again. Or perhaps we fear that the recog nition of our past as strangers might shatter our confident and selfassured, at times arrogant, identity as "Americans." Regardless, one thing seems quite clear: most of us North Americans have a profoundly shortterm memory. Forgetful ness is our common malady. We need to be reminded, as the ancient Israelites were reminded, that we, too, were once strangers in the land (Deut. 10:19). While these reflections are motivated by the contemporary events along the border regions of the United States and Mexico, I would also like to consider in what follows some of the historical references to the desert in the Christian tradition as well as in the work of some modern poets before returning to the realities of death occurring in these regions today. It is not surprising that the geography of the desert occupies a central place in the biblical imagination. The context of the Bible is, indeed, the stark, arid, des olate deserts of the ancient Near East. And it is in this difficult milieu that the ancient Jews interpreted and experienced the Divine, as have the Muslims. To any careful reader, it is clear that the desert landscape influences and informs the way in which God is represented and symbolized in biblical times. It left its mark on the theological language and beliefs of the ancient Jews, Muslims, and Christians. Indeed, one might see the desert as a major character in the biblical texts, beginning with the narrative of Exodus. In Exodus, this charac ter is frightening and untrustworthy. The desert is synonymous with exile and often wears the mask of death. "Was it for want of graves that you brought us out of the land of Egypt. . . . Why did you bring us out of Egypt,to kill us and our children and livestock with thirst?" (Exod. 17:3). The faith in the "prom ised land'" that Moses sought to instill in the Israelites proved to be precarious and fragile when tested in the unforgiving and deathdealing environment of the desert. Even Moses's faith wavers: "Why have you treated your servant so badly? . . . Where am I to get meat to give to all these people? For they come weeping to me and say, 'Give us meat to eat.' . . . If this is the way you are going to treat me, put me to death at once" (Num. 11:10–15). And as we know, Moses dies in the desert. He never made it to the "promised land." Dr. Martin Luther King Jr. also invokes this narrative, fully aware that he, too, may share the fate of Moses: "I may not get to the promised land with you." Anyone with experience in hot and arid desert regions will be able to under stand the challenging and terrifying countenance of the desert. Inhospitable to human survival, impersonal and unrelenting to human needs and desires, the desert is a location where body and soul are easily wounded beyond recovery. Nothing seems to be in moderation here: the sun is fierce and excessive, deaf to the pleas of pilgrims seeking the refuge of shade. Any traveler to these regions will understand why clouds thus signal the presence of God to the wandering Jews in biblical times. Clouds not only hide the face of God (and hence are metaphors of Divine incomprehensibility) but they also hide the severe face of the sun, providing an exiled people with respite from its damaging power. And clouds, of course, indicate rain. In the Sonoran Desert, however, even the summer monsoon rains come with excess, announcing themselves with violent thunder, piercing lightning, and the suddenness of a flash flood, striking and pounding the earth with a violent force. Even the rains do not know gentleness. The desert terrain itself is immoderate, a parable of immensity, as vast as the sky. Surely to a migrant on foot, the terrain seems endless, a kind of cruel, banal infinitude. In his study of the symbols of the desert in biblical and Christian thought, George Williams identifies at least four themes in the interpretation of desert: (1) the desert is a wasteland awaiting the blossoming of paradise; (2) the desert is a place of testing and punishment; (3) the desert is the location of God's nup tial union with Israel or the human soul; and (4) the desert is a place of refuge or contemplation.3 Finally, as Bernard McGinn has explained with regard to the mystical traditions, the desert can become a symbol of the incomprehen sible and inexpressible God (the God beyond God).4 In this case, God's nature adopts desertlike characteristics. God is the "Divine Desert." The Egyptian monks were among the first in the Christian tradition to take to the desert to encounter God (the Jewish community known as the Essenes had already done so at the beginning of the Common Era). Many of the above themes associated with the desert motivate and define their spiritual quests. For one, their journeys to the desert were interpreted as a step in their detach ment from the attractions and distractions of the "world." By withdrawing to the desert, these ascetics would empty and void themselves of the comforts and pleasures of civilization. They welcomed the emptiness of the desert, an abyss or void, as a partner in their search for a naked, unearthly wisdom. Away from the noise of city life, they might hear God in the silence of the desert wind as Elijah once did. For these hermits, the model of the spiritual life was the nakedness and stillness of the desert. And they sought to cultivate this des ert life within the depths of their own souls. Although there are no studies of the spiritual experiences of migrants crossing the desert through Arizona, it is difficult to believe that these immigrants experience the desert in the same way as the hermits did. In spite of the belief among many Eastern and Western monks that God may be encountered in the simplicity and emptiness of the desert, however, very few of them actually referred to God as desert. Bernard McGinn insists that none of the early monks used desert language to describe the nature of God. It was left to medieval Christian thinkers to create "desert" language about God. Why was this theological language so slow in coming? Is it because the desert was a dwelling place of demons, not God? Was the emptiness and void of the ancient Near Eastern desert too life threatening to ascribe to God? For those monks with longsuffering experiences of the desert, like the migrants cross ing the Arizona desert, was this region too hostile, too fierce to associate with the merciful God of scripture? And finally, why does this reluctance give way to a daring willingness to use desert language to describe God among some medievals? In the West, it was PseudoDionysius who first connected the Exodus story with the theory of Divine incomprehensibility. With Dionysius, reference to the desert suggested the unfathomable and vast nature of God, a nature that no intellect could plumb or exhaust. In this manner, a disciple of Dionysius, John the Scot Eriugena, expounds on the transcendent nature of God: "A more profound interpretation understands it as the desert of the Divine nature, an inexpressible height removed from all things. It is 'deserted' by every creature, because it surpasses all intellect, although it does not 'desert' any intellect. "6 This emphasis on the inaccessibility of the Divine nature to human conception would find a more elaborate and sustained formulation among various German theologians. It was in the verdant forests of Germany, ironically, that desert language of the Divine became more pervasive. The work of the German beguine mystic, Mechtild of Magdeberg, is a step in this direction. She provides a prescription for dwelling in the desert and for speaking of the Divine. Besides recalling the ascetical traditions of desert language, this remarkable passage indicates a connection between the desert of the inner soul and the Divine Nothingness of the Godhead. In a manner reminiscent of Dionysius or Eriugena, Mechtild names the Divine as a reality beyond being, as a nothing ness or emptiness that exceeds the realm of human knowledge and existence. God is nothing. We see this position even more clearly with Meister Eckhart. In this passage, Eckhart implies a union of indistinction in which the soul merges into God, or more precisely, into the unnameable desert of God, the God be yond our conception God. In this empty place of Divine oneness, where all human conceptions are empty, the soul is united with the "solitary wilderness" of the Divine: "God's ground and the soul's ground are one ground." Another German text called the "Granum sinapis" is similar in its theology. One passage describes the journey of the intellect first in climbing a mountain and then in fleeing to the desert. The mountain of this point, Ascend without activity, O intellect! The road leads you into a marvelous desert, So broad, so wide, It stretches out immeasurably. The desert has neither time nor place, Its mode of being is unique. . . . It is here, it is there, It is far, it is near, It is deep, it is high, It exists in such a way that it is neither this nor that. The vastness of the desert terrain is an icon of the grandeur and inexhaustible nature of God. Other mystics—and surely many ancient peoples—chose the symbol of the ocean to make this point. The immeasurable depths and darkness of the abyss of the sea was a parable of the unfathomable abyss of the Divine. And the ocean symbol would have a further benefit: the analogy of a river flow ing into the sea would resonate strongly with those mystics seeking union with the Divine Beloved. So, why is it that Eckhart and other German theologians turned to desert language in their Godtalk? As we have seen, part of the answer is the influence of Dionysius among many German intellectuals in the Middle Ages. Perhaps, however, as McGinn states, this is also explained by the fact that there are more forest deserts in Germany than anywhere else in Europe. Or perhaps the immensity of the des ert sky and the brilliance of the sun proved alluring to these forest dwellers, to a people eager for the feeling of sunlight bathing one's body. Regardless what the exact answer is, it is questionable whether or not these theologians understood the lifethreatening and hostile effects of desert terrain. Perhaps this is why the early desertdwelling hermits, including the Egyptians, were unwilling to ascribe desert language to God. Even if they believed, visavis scripture, that the soul's betrothal to God occurs in the simplicity of the desert, they were too well schooled in the dangers and suffering of desert living to see the desert as a parable of Divine nature. The desert is indifferent, merciless, devoid of forgive ness, a place of demonic dominion, a place of death. If the desert is Divine, then it is a god too ambiguous and uncaring to be revered. A desert god shows signs of cruelty. This kind of god is all too close to the gods of tragedy, to the protests of Shakespeare, for instance: "As flies to wanton boys, are we to the gods, they kill us for their sport. "11 Perhaps this is what the biblical figure Job most feared, that his God is not a friend at all, but an enemy. As Job's life is undone by the experiences of physical and spiritual affliction, he files a lawsuit against the Almighty. Is the Almighty responsible for, or at least indifferent to, the suffer ing of his people? Does the Divine, after all, contrary to Eriugena's claim above, desert His people in the scorching heat of the desert? Such daring questions naturally arise when one tries to make sense of the deaths occurring in the desert regions of our borders today. I, for one, cannot help but share the reluctance of early Christian theologians to name God as desert. In light of the harsh and meaningless deaths of immigrants in the desert regions of the border today, I find myself uneasy with a devotion to the "Divine Desert." This experience of the terrifying countenance of emptiness is already sig naled in early modern times by the figure Blaise Pascal, who cried out in ter ror, "The eternal silence of these infinite spaces fills me with dread." Modern science, witnesses Pascal, emptied the universe of God. For many in modern times, then, the desert becomes a symbol of absence and loss, a representation of the death of God. Needless to say, this brand of emptiness is far removed from the meaningful descriptions of emptiness in Christian mysticism or in Buddhism (sunyata). When Pablo Neruda wrote of the desert terrain of the mining regions of northern Chile, for instance, he recalled a traditional biblical setting, the desert as prophetic space, but now with characteristics of this modern age. Neruda speaks as a prophet of the old and new, of ancient and modern times. While Neruda's poetry evokes feelings of modern, existential anxieties ("I've come once again to lonely bedrooms, to have a cold lunch in restaurants, and once again I throw my pants and shirts on the floor, there are no hangers in my room, or pictures of anyone on the walls"), he also summons language that echoes biblical precedents, as in his passionate words of the desertdwelling people of northern Chile. I delivered myself up to the deserts and the man of the slag, came out of his hole, his mute harshness, and I knew the sorrows of my lost people . . . And then I went through streets and told everything I saw, I showed the hands that touched the lumps full of pain, the lodgings of forsaken poverty, the miserable bread and the loneliness of the forgotten moon. And elbow to elbow with my barefoot brother, I tried to change the kingdom of dirty coins. If the desert prophets of Israel—Amos or Isaiah, Micah or Jeremiah—lived today, one could imagine such powerful words coming from their lips. In addition to this poignant reading of the desert as a location of suffering and injustice, desert language in Neruda evokes the experience of exile. "I am a wandering son of that which I love," Neruda writes. "I am a wanderer, I live the anguish of being far from the prisoner and the flower." Even before his exile from Chile, Neruda's works resound with a sense of alienation. He speaks to us from the perspective of a stranger and alien of this earth. As the title of one of his great works suggest, Residence of Earth, Neruda wrote a poetry of tempo rary residents, of pilgrims in exile. And his words reflect this tragic sensibility. His poems are filled with plaintive and black tones. Neruda's poetry is an elegy dedicated to all who feel the desolation of desert space and time, perhaps what many of the migrants crossing the desert through Arizona feel. In Canto General, Neruda's desert language, however, describes the particular anguish of the downtrodden and destitute. In a poem titled "El desierto" ("The Desert"), Neruda describes the nakedness of the terrain and the struggle for life in such landscapes: "The sun breaks its glass in the empty space, and the earth agonizes with a dry and drowning noise of crying salt." In this place "without plants, without claws, without dung, the land revealed to me its naked dimen sion. "18 This nakedness, this vulnerability is shared by Neruda the exiled poet and by all refugees and wandering peoples. Here the traveler is lost in the immense dune, oppressed by the darkness of the sky, drowned in the vast sea of arid, scorched terrain. The North is no longer the beacon of freedom. Death has extinguished the light. In another Lorca poem, Death interrupts the journey of an Andalusian on the way to Cordoba. Before I ever reach Cordoba. Cordoba. Distant and lonely. If some Christian mystics interpreted the desert as a location of a possible Divine encounter or even as a parable of the incomprehensibility of the Divine nature, others, including the ancient Israelites, read more ominous and dark signs in the symbol of desert. The desert to these latter figures is a sinister realm where hunger and thirst, unforgiving heat and vast stretches of land become the occasion for death's visitation. In our own times, for too many immigrants from the south, the journey to the North is a battle with these demons. The North is distant and lonely, forever absent, forever unattainable. If it is not the heat and thirst, the cause of countless deaths is the sheer vastness of the desert and the number of miles they travel. Exhaustion comes quickly in this terrain, and diz ziness and confusion often accompany the physical experience of the heat and insatiable thirst. In this condition, it is easy to lose one's way in the labyrinth of the desert. Lorca's description of being lost, of locating neither road nor sky, is a precise expression of many immigrant's experiences. The light summon ing them to the "promised land" of the North has been extinguished, and the sky, dark and undecipherable, hides the way. These desert pilgrims are ship wrecked by the immensity and abyss of the desert landscape. It is not difficult to imagine them repeating the mournful and protesting words of the Israelites, "Was it for want of graves in Egypt that you brought us into the desert to die?" (Exod. 14:11). Our immigrants might echo, "Was it for want of graves in Mex ico and Central America that you brought is to Sonoran Desert to die?" I opened these reflections by speaking of the surprising beauty of the So noran Desert in Southern Arizona and northern Mexico. If there is a good amount of rain in the winter months, this terrain blooms with an intensity of color and scent and shape. Wildflowers are resurrected during the spring in locations that seem inhospitable to plant life. In staring at this sight, so unex pected, so holy, I recall what the Egyptian monks describe as a "desert blooming with the flowers of Christ." Perhaps for similar reasons, the Tohono O'odham people (the "Desert Dwellers") consider much of this land sacred (especially the mountain of Baboquivari, where the god I'itoi dwells in a cave). It is not an exaggeration to see in this terrain the aesthetical attractiveness of a garden. I wonder, then, how to make sense of the gardenlike beauty in light of the suffering and deaths of hundreds of immigrants. If the ecology of the Sonoran Desert cannot exactly be described as a wasteland, does not the reality of death witnessed by this terrain justify such a title nevertheless? Perhaps it is a waste land, simply for the spent lives exhausted here if not for geography and flora. Or are there the seeds of a garden experience even here in the midst of death and suffering? Perhaps what I am asking is the same question posed by many of us: how does one reconcile the stunning, even at times, ecstatic experiences of the beauty of nature with the horror of human history, with the experiences of exile and poverty, violence and war? Surely, Dante, another great poet of the desert, explored this terrain. In Inferno, the pilgrim is lost in the gran deserto (great desert) until Virgil appears and guides him to the Garden of Eden. As many critics have suggested, the metaphor of desert in Dante represents the desert of Exodus and the experience of exile in Dante's own life and in human history. At the same time, Dante alludes to the hope (a hope sustained by the possibil ity of beauty and love) that a garden will reveal itself in the midst of the desola tion and suffering of history. Recall that in Paradiso, the third part of the Divine Comedy, it is Dante's beloved Beatrice who takes over as the pilgrim's guide. It is now love that allures the pilgrim and that impels his will and causes his wings to sprout. It is Dante's experience of love that makes possible the ascent into paradise where he will be astounded and silenced by a vision of God (symbol ized by the rose). It is not surprising that images of a garden appear in much poetry of the desert, including the Bible. In the ancient Near East, a garden would have been a place of salvation in the context of the threatening desert. In the Song of Songs, for instance, the delights and intensity of love, the rapture of beauty, the sensual joy of both nature and the human body are celebrated in the context of a garden. This garden appears to be a refuge from the trials of history, a Garden of Eden in the context of exile on earth. Perhaps in these contexts, the garden is nothing else but a symbol of hope. As I look across the expanse of the Sonoran Desert—its gardenlike terrain and awesome immensity—I am filled with ambivalence. I witness beauty everywhere and yet also hear the laments of immigrants burnt by the sun. It is a tragic beauty that I recognize, a beauty that attests to the contradictory and ambiguous face of the human experience. This ambiguity is felt not only in the experiences of beauty and exile, nature and history, love and suffering, but also dwells with the experience of the Holy itself, as Rudolph Otto once sug gested. For Otto, the Holy is a mysterium tremendum et fascinans.22 This power and mystery is felt as an awesome, even terrifying mystery on the one hand and as an attractive, beautiful, trustworthy mystery on the other. As holy space, the desert wears these different masks, not unlike the ancient god Janus, a god of doorways, thresholds, and borders. He stands on the border and looks north and at the same time south. He stands nowhere, in between two different positions and places, in liminal territory. Janus is a contradictory figure, situated in a location of contradiction. It seems to me that exiles and immigrants—if not us all—wear the masks of Janus, looking toward differ ent cultural and religious horizons with lives marked by contradiction, paradox, and ambiguity. If this is true of the human condition itself, perhaps exiles and migrants understand these facts better than anyone else. The tragedy of our contemporary border situation, however, remains the fact that the ambiguous and liminal space of the border has now become a gravesite for numerous pilgrims. While some North Americans blame the immigrants themselves for their own deaths (viewing their deaths as a kind of punishment for the sin of illegal trespassing), others see in these deaths a loud cry for a change in border policy. 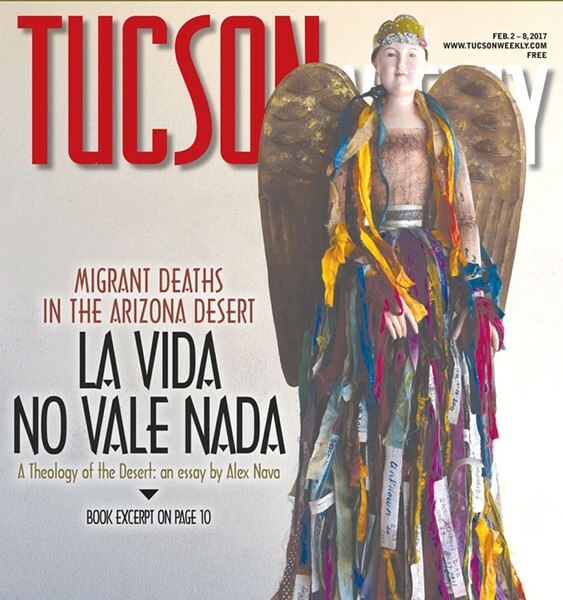 For this to happen, we need the prophetic voices of justice in bib lical texts, in the poetry of a Neruda, Lorca, or Dante joined with the deep spiri tuality of the mystical traditions, traditions that are reflected in images of the Virgen de Guadalupe, for example, that many migrants carry though the Arizona desert. In following the paths of these great prophets, we might be led to the mysterious regions of the human soul, crossing and transgressing the limiting borders that confine and prevent our spirits from exploring new terrain and from discovering new possibilities that would allow us to grow as individuals and as a human community. In following the trails of the border crossers of history, past and present, we might be led to discover the faces of strangers within our very selves and thus to respond to the other with justice and compassion. Perhaps only when this happens will we be able to announce, with T. S. Eliot, that "fire and the rose are one. "23 Only then will the roses of the garden bloom in the scorched fire zone of the desert, and we might begin to find credible the hope of biblical texts and mystics that we will be united with God in an ecstatic and consuming love.